In happier times: former Manchester United manager Alex Ferguson and former team captain Roy Keane share a moment of celebration, as they hoist the Premier League trophy in Old Trafford, in 2001. ROY KEANE says an intervention by Eamon Dunphy when the former Manchester United captain was appearing before an FA disciplinary hearing spectacularly backfired and resulted in him being handed down a five-match ban. Keane makes the remarks in his new autobiography - the contents of which have leaked after the book accidentally went on sale in one Tesco store in the UK yesterday. In the book 'The Second Half', Keane takes aim at a number of former team-mates and colleagues, including ex-Manchester United boss Alex Ferguson, and reveals that a training ground bust-up with the manager led to him leaving the club. He writes that he apologised to the Scot but later regretted it: "I had nothing to apologise for." In another chapter, he recalls how he had brought Dunphy, ghost-writer of his first biography, over to the UK to give evidence at a disciplinary hearing into a tackle he had made on Manchester City payer Alf Inge Haaland. In a contentious chapter in that book Keane wrote: "I f*** ing hit him (Haaland) hard. The ball was there to be won, I think. Take that you c**t." That passage resulted in the English FA charging Keane with bringing the game into disrepute. 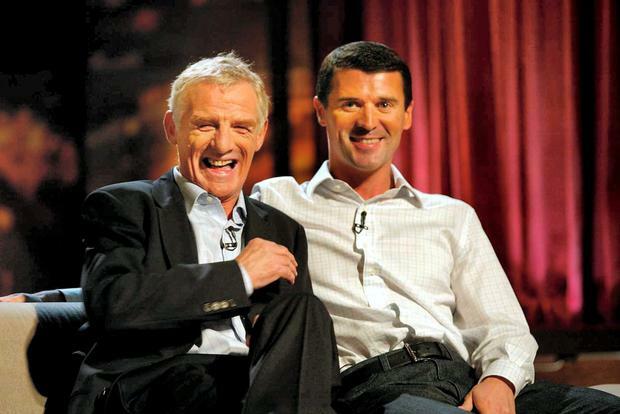 Confident he would escape punishment, Keane brought Dunphy in as his key witness. Yet the move proved to be a disaster. Rather than clear his name, Dunphy's evidence resulted in Keane picking up the ban and £150,000 fine. "Eamon was my ghost-writer and had come across from Ireland for the hearing to be a witness," writes Keane. "He had already said that he'd used his own words to describe the tackle. Before he went in, I'd been going to say to him, 'Eamon if they ask you if you think I intentionally went to injure Haaland then say no'. "And Eamon's three words back to Sturman were, 'Without a doubt'. That was my case, my defence, out the window. "Eamon had written the book; he was my witness. Eamon felt he was on trial, and that it was a criminal court. He wanted to distance himself from it and I could see his point of view." Keane adds: "I looked at him and thought, 'I'm definitely f***ed now'. I'm not blaming Eamon at all but he didn't help." Keane also outlines the complete collapse of his relationship with Ferguson during his time at Old Trafford and recalled how a training ground bust-up with United's assistant manager Carlos Queiroz, and Ferguson played a role in him leaving the club. Keane said that after criticising Queiroz, he rounded on Ferguson. "You as well gaffer," Keane retorted. "We need f***ing more from you. We need a bit more, gaffer. We're slipping behind other teams." Keane says he later regretted apologising. In another revelation, Keane says he head-butted United goalkeeping legend Peter Schmeichel during a row in a pre-season tour in 1998 and also described Ferguson as a 'mascot' for United's former shareholders JP McManus and John Magnier. Tesco say they are investigating how one copy of the book, which is not due out until Thursday, went on sale. "A copy of Roy Keane's book was sold in error at our Burnage store. Colleagues are currently investigating how this happened," the chain said.